Answers about sole proprietorship in Sweden. How does VAT and taxes work for a sole trader in Sweden? Where can I find an explanation of social security tax and VAT rules in English that I can understand? Where to find Help in English for Enskild Firma? Are SIC an SNI codes the same? What should I do if I have sold goods or services in Sweden without VAT registration and without F-tax? What is F-skatt in English? Can someone explain Individual Social Security Charges - ISSC - for sole traders in Sweden in ENGLISH please! 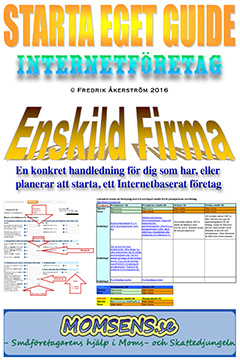 "I made appointment with skatteverket for English discussion base on this service they provide - Ny Foretagare - Enskild Firma but up till now they haven't found a suitable person that can handle it in English. I am still learning Swedish language. Although I have been reading about tax in Sweden but I still have some questions I need to understand that is the main reason why I contacted you." I started my page and my service for sole proprietors because I realised when starting my own company how much you need to research and the surprisingly limited info and help that is available for certain topics that every company needs to investigate each time it's started.. it's like every company needs to re-invent the wheel every time! Sadly most of my info is still only available in Swedish, google translate of momsens.se pages will help you but as always specific expressions and local rules will not translate that well. But you can use my Swedish-English translations service if you would like to manually translate a page or a document from Swedish to English with industry-specific terms and keywords. I registered for a sole trader business in Sweden February 2017. I am due to file in my first 3-month tax declaration next week. First quarter VAT (Jan-Mar) reporting had the deadline 12:e May. You are already too late for the normal standard reporting of VAT if you have selected to do it quarterly. But you could change to yearly reporting instead. Have you received an exception or are you referring to the periodic reporting (EC sales list) deadline 26:th May? The special reporting for MOSS (reporting of the electronic services to private customers in EU), is done at the latest on the 20:th after each quarter. In other words, Jan-Mar period should have been filed on the 20:th of April. Apr-Jun deadline is 20:th of July. SE - Country code for Sweden. 01 - Sequential number if your business makes several different VAT reports for different parts of your business. I run a small software company (SIC codes - 62010). My sources of incomes are 1. Google Advertisement, 2. Building web and mobile apps 3. Selling source codes on my website. In Sweden, we call SIC for SNI but your code for software developer is correct 62010. Additional codes that may be applicable for you are 73111 Advertising agent (making money with Adsense), 63990 if you are making money with affiliate links. But in your case 62010 is your main code and maybe the only one you need to use. 1. I accept payment only from PayPal and Stripe then transfer the money to my business account. My customers come from all over the world (Internet Business), how does this affect my VAT and accounting? How payments are done does not affect the VAT or company registration, but will affect how the accounting is done. It is where you and your buyer are registered that has the most effect on how to handle the accounting and VAT for each transaction. To simplify you could say that the country your customer is from will determine your VAT and accounting. 2. I have not been registered for VAT yet by Skatteverket. What does this mean? This means you cannot add VAT on your invoices yet. You are in a grey zone between hobbyist and a real company. 3. I have a business account with Nordea but before then I have made some expenses through my personal account and I have the receipts. What is the best way to include it as expenses? Collect all expenses and receipts, summarise them in an excel spreadsheet and attach all old invoices and receipts to the Summary (Excel) Invoice frontpage. You will book the total cost and total VAT as the first post in your accounting software, thereby enabling VAT deductions on purchases made before VAT registration went live. “You may make deductions in your income tax statement for what you need to be able to maintain the business. This may, for exam­ple, be a matter of having a company car or an office at home or costs you had before the business began operating." Any expenses you had and that was paid with PRIVATE MONEY you can account like it was an owner's investment. This is also true for expenses you incur with your private credit card, like paying for some images to your app online from a stock photo page. 4. I want to know if social security tax is deducted before income tax or the other way round. Also, is there any other tax I will pay apart from Social Security Tax and Income Tax. The short answer is social security tax and income tax are calculated based on the TAXABLE RESULT (Överskott), they are then added together as the TOTAL TAX you pay which in theory should be equal to the PRELIMINÄRSKATT (monthly preliminary tax payments). Egenavgifter (Individual social security charges - ISSC) is based on the result. But to complicate it further ISSC is also deductible during the current year. The ISSC you will pay on the RESULT is a deductible expense for you and will be deducted in the year it belongs. Since the ISSC is not debited until the declaration has been examined, the ISSC is calculated according to a simplified method implicating 25% of the RESULT before the standard deduction (Schablonavdrag). This is where most people just go: ? To clarify the real ISSC is calculated on the TAXABLE RESULT which is the RESULT from P&L minus the ISSC. To calculate ISSC you must already know ISSC.. this requires setting up a formula and calculating backwards. To get around this the Tax Authorities simplified the calculation making it more confusing at the same time. The simplified ISSC is called Standard Deduction (Schablonavdrag) and is normally set to 25% of the RESULT from P&L. real ISSC is calculated (28,97%) on the TAXABLE RESULT. If we know the ISSC will be 28,97% then the TAXABLE RESULT must be the RESULT without 28,97% ISSC since it is deductible. Just like a price for the consumer would include 25% VAT the RESULT for a sole trader includes 28,97% ISSC. What is the price without VAT? Or in other words - What is the RESULT without ISSC? We need to calculate backwards just like we do when calculating a price without VAT. A price without 25% VAT can be calculated as PRICE / 1,25. The RESULT without 28,97% ISSC can be calculated as RESULT / 1,2897. Assuming a RESULT on 100. Which means that the ISSC of 28,97% implies a tax of 22,46% of the RESULT (P&L). The real ISSC is lower than the nominal 28,97% since the real ISSC is calculated on the RESULT which is lowered by the ISSC amount because it is deductible (in other words ISSC is also allowed to be a cost during the current year). STANDARD DEDUCTION is calculated (25%) on the RESULT. This means you have paid 22,4625882 - 21,7275 = 0,7350882 less this year than what you should be paying in reality, without the use of the simplified calculation involving STANDARD DEDUCTION (SCHABLONAVDRAG). The amount that is missing or in other words, the remaining taxes that you did not pay this year will be added to the TAXABLE RESULT next year. The difference between ISSC based on RESULT - STANDARD DEDUCTION and real ISSC is adjusted at the next yearly reporting, meaning the real final tax will not be completed until a year after the currently reported year. This is why the simplified method leads to even more confusion, but makes it easier to handle and calculate the taxes to be paid during the current year. This also makes it harder to see if you are paying the correct tax amount. If the Tax Authorities deducts the wrong amount of tax it is really hard to check and detect, which is not a good thing. A more straightforward and easy to understand tax model for sole traders should be implemented, especially for micro companies below 1 million SEK in turnover. Note: ISSC is usually 28,97% of the TAXABLE RESULT but may vary slightly depending on a different number of “Karensdagar” (how many days you go without pay if you get sick). It is also different for the very young and very old people. The exact rules governing the ISSC can be found here. The Income Tax part is progressive and will increase with your earnings. You will be hit harder once the TAXABLE RESULT surpasses 200K (7,5% reduction of ISSC for age 26-65 no longer applies for earnings above this limit, 452K (+20% federal tax) and 638K (+5% “Robin Hood tax” which is actually called “Värnskatt”). Usually, it’s better to switch to AB (LLC) when you hit 450K. In other words, the tax on a P&L result of 100K is 29,73%. As you are a software developer you will be able to gain a better knowledge from analysing this spreadsheet for calculating taxes for a sole proprietorship on a monthly basis. I do not certify that this is a completely correct model but this is my best take at trying to understand and reverse-engineer the Swedish tax system for a sole proprietorship. THIS would be a great idea for an app that you could make. I have thought about making at least an IOS app for it, but never got around to actually do it and since it is tremendously complicated and I do not know if I want to sell an app that I will have trouble verifying if it is completely correct. But maybe you are the right one to dig into this kind of project. 5. I assume that I have to pay 30% as income tax from the business profit and 25% as social security tax. Are these values correct with my kind of business? At the same time, there are no reductions for higher incomes and this really hurt high revenue sole proprietorships. Not only do the reductions disappear but you get additional taxes on top of everything! 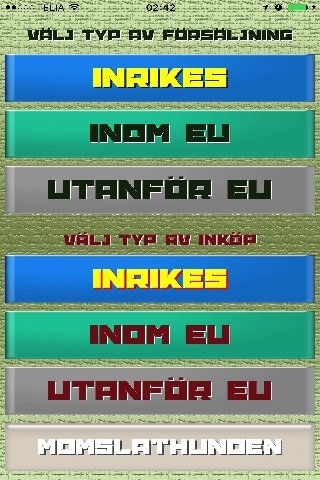 You can even get the Robin Hood tax (“Värnskatt”) if you are really unlucky. But smart planning and the use of "Accrual fund" Periodiseringsfond, Expansionsfond etc, can easily make you avoid facing the worst tax effects. The Income tax is progressive in Sweden and will differ greatly depending on your income level, or in the case of a sole proprietorship, the TAXABLE RESULT. Social security tax will be around 28,97% based on the TAXABLE RESULT, but it will only be adjusted precisely the year after in the next PIS. The current year the social security tax will be calculated as 25% in the first step (B), and this simplified rate is called “Schablonavdrag” or Standard Deduction in English. You could calculate the exact tax in the current year directly when you know the level of the ISSC. Instead of using 25% in step B we could use the real rate 28,97%, which is what I have tried to in my own “Salary Calculator” here. As you see these combined taxes, deductions and reductions make it impossible to calculate the actual total tax by hand, you need to build a model which is insane really. It should be simplified to a simple income tax interval with a few steps or zones. 6. I am not registered for VAT does it means that I will not charge for VAT or declare VAT? You are not allowed to charge VAT before you are VAT registered. You cannot report or declare any VAT returns before you have been given a VAT-number or SE-number. Invoicing before this must be done without VAT and reported as “income from Hobby” in your PIS, or you could tweak it into your accounting later and book it as VAT-free sales. None of the options is completely accurate since you should have had a company registered. But these are the options you have to sort out the situation as good as you can. 7. I don't want to take drawings or salary for the next six months is there a better way to do it? 8. I stated that I will make 180,000 SEK per year which is around 15,000 kr per month when I registered for F-Tax but now I am making around 12,000 kr per month. Which number should I use to estimate my income tax deduction? Use a lower figure than you expect when calculating F-Tax for the coming year, or else it will be like in this case, you are paying more tax each month than you should and will need to wait until after the PIS in May next year to get it back. At the end of the year you can sum up what you have paid in preliminary tax each month (PRELIMINÄRSKATT) and if you have done better you can pay more, or just wait until May when you see more exactly the difference between paid tax and actual tax you need to pay. But beware of the borderline 30K. If you have made a much better year than you expected and your tax will be more than 30K higher than expected, then you need to arrange an extra payment before the middle of February the year after the current income year. In other words, if 2017 is a super good year, much better revenue than calculated, you need to make the extra payment before the middle of February 2018 (deadline around 14:th Feb) to avoid high penalty interest on the amount above 30K. 9. I accepted some payment online before I applied for F-Tax. Later I understand it is illegal so I don't know how to account for it. It is NOT ILLEGAL, it will be considered an income from your hobby, you are still allowed to sell physical and digital stuff for up to 30000 SEK per year before you are required to register for VAT and “become a company”. You can either declare this as an income from a hobby in the yearly PIS - Personal Income Statement (Deklarationen or Inkomstdeklarationen). You fill out a sheet called T2 (SKV2051) which can be done online. The result (your revenue) is then entered in point 1.6 in the PIS (a total loss is entered in point 2.3). “In Sweden, an entrepreneur may apply for approval for F-tax if they wish to. Approval for F-tax is relevant mainly for anyone paying remunerations for performed work. Anyone who contracts an entrepreneur who (only) has approval for F-tax is neither required to pay social security contributions nor make tax deductions when paying remunerations for work. The approval for F-tax has no effect on the taxation when paying for goods.” See original F-tax doc here. What this means is that when you do not have F-skatt or F-tax then the one buying SERVICES from you can become liable to pay social security fees FOR YOU as if YOU WERE AN EMPLOYEE. The risk is actually FOR THE BUYER, not you. And it is not illegal. If you only sell PHYSICAL GOODS you actually do not need or require F-tax at all. If you sell mouse pads you can do that perfectly legal without F-tax and without risk for the buyer., but you WILL NEED VAT REGISTRATION. It is only SERVICES that are relevant for F-tax. Many foreigners are confused about this extra tax with the very strange name Värnskatt. I usually translate it into a term that is immediately intelligible for an English speaking person - Robin Hood Tax, because that it exactly what it is! This tax (Värnskatt) was first introduced into the Swedish tax system in 1996. In the income declaration or PIS for the year 1995, handed in 1996, the new extra tax "Värnskatt" (could be translated into English as Rampart tax) was first introduced into the Swedish tax system. It's simply an extra tax of 5% that is charged based on all income above a certain threshold, currently set to around 638K per year in TAXABLE RESULT (point 10.1, överskott, in the income declaration of the business) from a sole traders perspective. The original Värnskatt or Rampart tax was introduced already in 1915 as a way to restore and rebuild the Swedish army during the troubled times of World War I. It was a fee for high-income earners to contribute to the defence of Sweden by a royal order. Today the extra 5% tax has nothing to do with the military or defence, it's just an extra penalty for highly educated and skilled people since Sweden today loves low educated refugees and wants to scare away all high -level people from Sweden to keep the all mighty Social Theocratic Party in power. Yes, I'm a bit ironic there but it still contains a lot of truth. In other words, you would have to pay an additional tax of 3100 for those extra 62000 you made. You will also have to pay federal tax or "statlig skatt" on 20% on those 62 = 12,4; because that is paid on all income above the borderline 452K. As well as paying the ordinary local county tax based on where you live, currently averaging 32%, which would imply a tax on those 62 of 0,32 x 62 = 19,84. The total tax on the highest/last 62K you made would then be 19,84 + 12,4 + 3,1 = 35,34. That is a shocking 35,34 / 62 = 57% TAX - welcome to Sweden! This makes Sweden the world champion in progressive penalty for high-income earners. Read more about this in the Tax Burden report for EU people here. The total tax pressure in Sweden is, however, not as bad as you might think compared to most other EU countries. If you can avoid reporting a Taxable Result over 638K thereby avoiding the Värnskatt, and even better the federal "statlig skatt" for taxable results over 452K, then the tax situation is actually not that bad in Sweden. If you are a sole trader earning 0 - 450K, then Sweden does, in fact, have a fairly acceptable tax level. The value comes from a pre-computed tax table that includes all the adjustments for Jobbskatteavdrag (job tax reduction), local county tax level etc. We need to lookup how much tax we need to pay on that 75K taxable result. Since tables are monthly we divide 75 / 12 = 6,25K. This is our lookup value for the lookup table, an expression you probably are familiar with as a programmer. The tax tables and explanation can be found here. As an example we use 33% local county tax, this means looking in table 33. First column (left column) is for people born 1952 or later, Common pension fee should be paid and the income is subject to job tax reduction. This is the column most sole traders should look. Column 3 counting from the left side is for retired people running a sole trader business. Column 4 is for veterans born before 1938 still operating a sole proprietorship. The other options are not relevant in a sole trader context. You see columns 1-6, it is no 1 to the left that contains the tax amount. But to find the right amount you must look up the monthly taxable result, in other words the interval where 6250 SEK is, then look at the corresponding value in column 1. We get the value 667 from the lookup table, this is the monthly TAX AMOUNT or income tax we pay on the taxable result. On the yearly 75K taxable result we pay 667 x 12 = 8004 SEK yearly income tax. 12. Since I started the business in February 2017, when am I supposed to pay tax? I still don't understand if I will start now to pay for preliminary tax against next year. Also, I read that a new sole trader business can take exemption for tax payment for 1 year or so. Tax Authorities will send you a decision and then you need to start paying right away every month. But if they have not yet decided on your F-tax status, then they can't send you a payment plan. Ask them what is going on. There is probably a bottleneck in the system with the massive immigration wave into Sweden recently. As a foreigner, your F-tax approval depends on other government agencies input as well. No you will get a delay of only 3 months, then you need to start paying Preliminary Tax. This will also affect year 2 and disrupt the monthly payments that year too. Could be an advantage for some but it is more administrative trouble than what it is worth. My advice is to pay monthly without asking for “Uppskov” or delaying payments. 13. Is their a difference between Kommunal Tax and Social Security Tax? If so am I supposed to pay Kommual tax? Kommunal tax is part of the INCOME TAX entity. 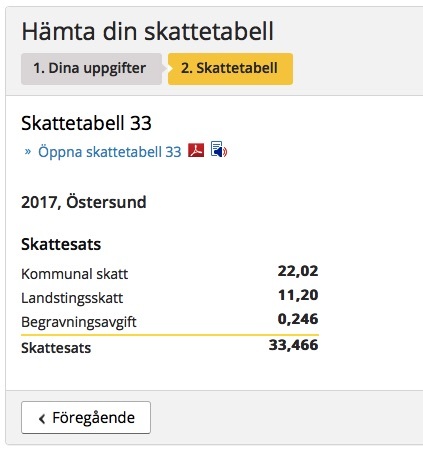 The Kommunalskatt is included in the tax tables that we used to lookup the monthly local county tax. The income tax includes: Kommunal tax, Landsting tax and funeral fee. It also includes different adjustments and deductions like the job tax deduction. All this is combined and calculated into a lookup table where you can find your tax based on an income interval. This tax is the same as for an employee. 14. Do I have to keep the receipt for all personal drawings and withdrawal? Yes, each withdrawal from the business bank account is an event that needs to be posted with a journal entry into the ledger. Print out the confirmation of the transaction from the bank and use this as your journal for your folder. Anything that affects the business bank account must be accounted for and verified with 2 separate sources, even if it is not always possible in reality. Like when you take out money to yourself, you don’t have any external invoice or document to use as a secondary verification. You only have your bank statement and your confirmation of the transaction, but both have your bank as a source, there is no 2nd source in that case. But for invoices, you have the invoice itself with the value and then the bank statement with the same value to verify. That is 2 separate sources. Still need to have docs or pages translated from Swedish to English?